Oh my, some things feel bizarre. 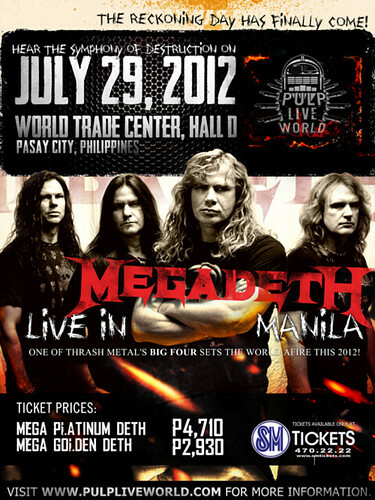 And Megadeth coming over in Manila for a concert feels bizarre. Megadeth is one of the grandfathers of thrash metal, well I’m not sure if they like being called grandfathers haha. They will shake Manila on July 29, 2012 at the World Trade Center Hall D, Pasay City. Buy online at SM Tickets or the tickets can be purchased at all SM Supermakets nationwide. Call 470 2222 for more information.